When I sat down to watch The Last Pig, I did so with the slight trepidation of a seasoned environmental filmgoer. But my worries were unfounded. While films about factory farming are known for using gruesome exposé footage to proclaim an ardent animal rights message, director Allison Argo’s picturesque, meditative documentary does the opposite. The film gives us idyllic scenes of the relationship between a small-scale pig farmer and his happy herd—and then it gradually unravels the logic of this utopia. Argo is best known for her documentaries focusing on endangered animals and conservation. Her production company, ArgoFilms Ltd., has produced 19 films and won several awards, including six national Emmys and the duPont-Columbia award for journalism. Argo has said that she was hoping to make a film about the ethics of eating animals for some time, and when she discovered pig farmer Bob Comis’s moral reckonings with his vocation in Salon and HuffPost, she knew he was the right subject. Argo’s team began filming Comis while he was still farming pigs for consumption, and they were there to capture the transition when he eventually decided to send his last pig to the market and give up animal farming for good. In one of many sweeping landscape shots, farmer Bob Comis feeds his herd. With countless long landscape shots in upstate New York set against a lively orchestral score, the film first follows Comis on his mission to offer a more ethical alternative to factory-farmed meat. Much like proponents of peaceful parenting, Comis explains that he herds his pigs and retrieves attempted escapees through strategies that play to their higher faculties (such as their attachment to the rest of the herd) rather than through confinement or punitive measures. Strikingly, it seems that this loving care flows in both directions. We learn that Comis started raising pigs at a time when he was battling clinical depression, and his communion with the animals helped him cope. I often wonder what motivates viewers to see activist films like this one, when they know they’ll encounter saddening scenes of animal death. Well, Argo’s film makes the payoff clear from the start: it’s the cute pig footage. Reels and reels of almost painfully adorable pig footage. Yes, the shots of misty early morning farmland and autumnal forests in upstate New York are gorgeous, but they pale in comparison to the film’s endless close-ups of these suidae beauties. In one of the film’s most glorious scenes of pig joy, we watch the swine splash, stomp, nuzzle, and roll around beneath a spewing fountain of water at mudbath time. Amidst the frenzied action, the camera focuses for a long moment on a sow blissfully lounging at the shore of the mud pit, nestling contentedly into the earth as she watches her family frolic. The mud wallow scene displays pure pig joy, an expression central to the film’s message. When the film transitions from these joyful pig bathers and content pig nappers to the inevitable slaughterhouse, we understand Comis’s internal conflict. The camera doesn’t linger on the gore, but the lifeless bodies of these once-lively friends is enough to give us pause. And when Comis finally decides he must transition to plant farming, we remain in that pause. It’s not exactly a happy ending. Comis sends the titular last pig to slaughter, and we’re left with quiet final scenes of his solitary vegetable harvesting. The crop shots are as beautiful as always, but Comis worries he won’t be able to make a living, and it’s hard not to imagine that he misses the pigs. I certainly do. 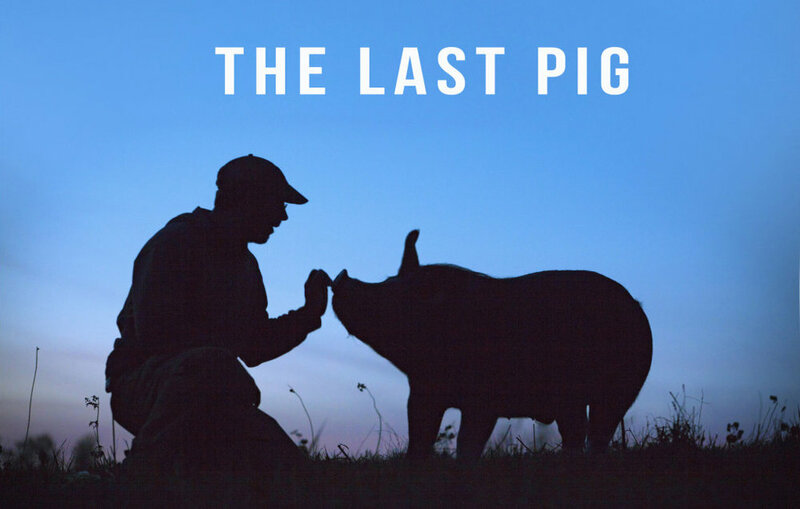 Unlike the clear message of a film like Eating Animals, The Last Pig doesn’t give us an easy dichotomy between good small farms and evil factory farms. Instead, it invites us to linger in the discomforting space between our values and our practices. Why should pigs be commodities when dogs are companions? Does “happy pigs make happy meat” really make sense? While environmental degradation and urgent attempts at climate action are both hurtling forth at breakneck speed, Argo’s film forces us to slow down and ask why, and for whom, we take action in the first place. The Last Pig began filming in 2014 and was boosted by an Indiegogo campaign to wrap up in early 2017. It just finished its festival run this past fall, with 34 festivals and several awards. The film is slated for public release in autumn 2019. If you’d like to bring The Last Pig to your community, you can set up a screening to start a dialogue. This article was produced as part of a partnership between Stone Pier Press and Earth | Food | Life, a project of the Independent Media Institute, and originally published by Truthout. Monica Stanton is a Stone Pier Press News Fellow based in Oakland, California.